Hi everyone! Hope you’re enjoying your weekend so far! As the temperature began to drop, I started to see vibrant leaves falling from the grey sky. To me, these changes signify that fall has arrived. Though I generally prefer the summer weather, in recent years, I’ve become more intrigued by the fall—as the change in season tints the earth with a myriad of vivid yet harmoniously cohesive colors. 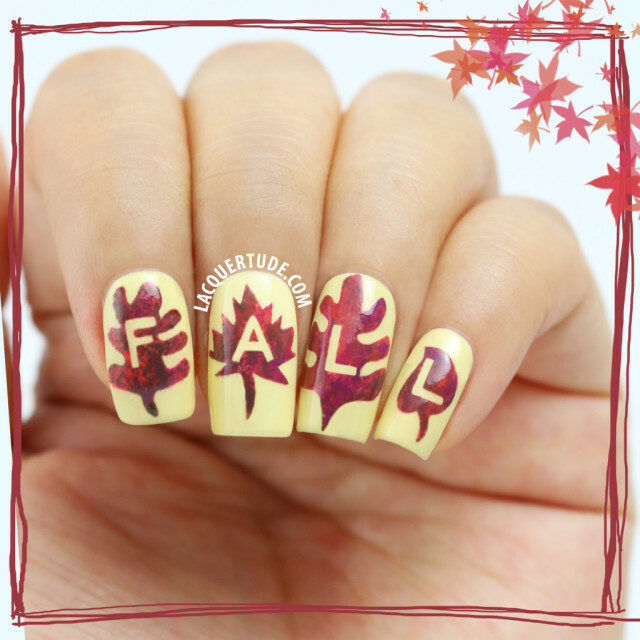 Naturally, fall leaves inspired today’s nail art! In fact, this idea haunted my mind for days as I reflected on how to represent the beauty of the leaves on my nails. Finally, after thinking through possible techniques and finding the perfect colors in my stash of Picture Polishes, I sat down in front of my desk to translate it into reality. Flirt (a rich magenta pink), Malt Teaser (a delicious milk chocolate), and Sunset (an eye searing neon coral). piCture pOlish Mellow Yellow—an absolutely gorgeous pale yellow with a stellar formula. 2 coats with top coat. piCture pOlish Malt Teaser is a delicious milk chocolate brown. Initially, I got this color purely because I knew I would need a perfect brown for nail art purposes and because I can always trust piCture pOlish formulas (I have never came across one polish that disappointed me out of my PP stash). But, when I swatched this on my nails, I fell in love. Can you believe it? A brown! Not just any brown though, this is a beautiful, decadent, milky, creamy brown ♥. More over, this was nearly a one coater. I’m sure if you have shorter nails, you could get away with just one coat. I confess, I loved this color so much that I’m certain I smelled chocolate milk while I polished with it. piCture pOlish Flirt is a rich magenta pink. This color was a bit of a chameleon. I think it shows up most color accurate in the photo above. However, in darker, warmer lighting, it shifts into a beautiful soft magenta red. It’s a gorgeous color that applied like a dream, perfectly opaque in one coat! 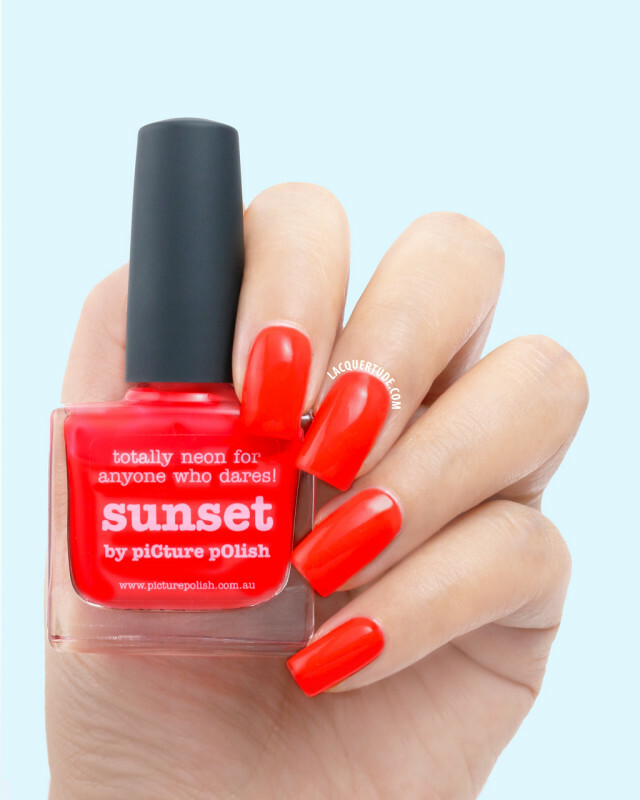 piCture pOlish Sunset is an eye searing neon coral. I’ll be featuring it again in the next nail art post. I was surprised to find that it added just the right touch of brightness to the fall leaves design and again, like all piCture pOlish colors, blended harmoniously with Mellow Yellow, Malt Teaser, and Flirt. Swatch shows 2 coats plus top coat. Here is a little tutorial to show how I created this look. Hopefully my pictures and step by step explanations are helpful for you. Feel free to let me know if you have any questions in the comment section. I will do my best to answer them all! PREP: Pre-cut all of the striping tape you need to mask the alphabets. It helps to draw on paper first so you know the length that’s needed. Then, make stencils with scotch tape by cutting sizes suitable for the length of your nails. Then stick them on a self-healing board. 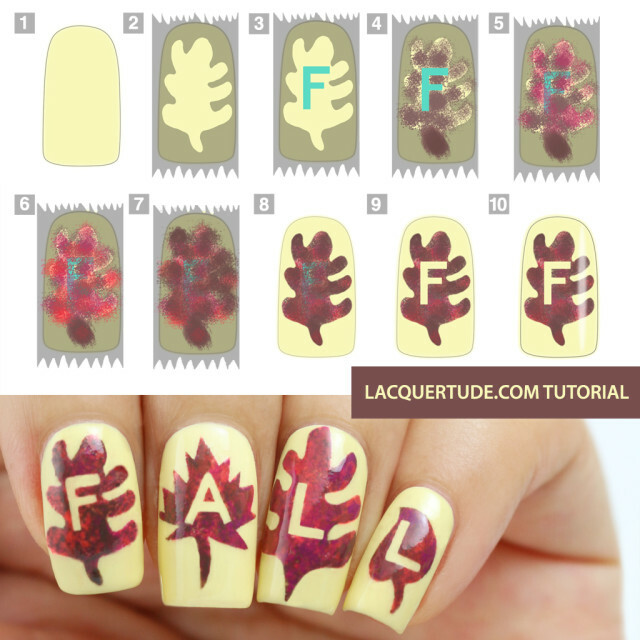 Draw out the leaf shape with a pen for all the nails. Then cut out the center with an exacto knife. Tip: take care around the corners of your design; making sure the knife does not cut too deep. Lift your completed stencil carefully with tweezers. Tip: peel off all 4 corners first, then work your way in toward the center. I learned this trick after I accidentally tore apart 2 designs. 1. Paint your nails with your favorite base coat then paint your base color Mellow Yellow. Let dry or apply quick dry topcoat. 2. Carefully tape your stencil onto the nail. I taped all of them at once. 3. Using striping tape, mask out the letter. Again, I did all nails at once. 4. Sponge Malt Teaser (brown). Tip: scatter the sponging to create a more organic effect. 5. Sponge Flirt (a magenta). Tip: if the color is too opaque for the look, you can dab some on paper and thin with acetone before sponging. 6. Sponge Sunset (orange). Tip: while sponging, try not to cover your alphabet completely, if you can see it, it’ll be easier to remove later! 7. Sponge Malt teaser one more time to blend all the colors. 8. Carefully peel off the scotch tape using tweezers. Tip: sponge and remove tape one nail at a time! 9. Remove striping tape with tweezers. Tip: this is the toughest step so do so gently. If you accidentally lift up some sponging detail, don’t panic; use your fingertip to gently press it back down onto the nail. Happy fall and thank you so much for reading!